Proximity sensors are the most common and affordable solution for no-touch object detection. The most commonly-used proximity sensor is the inductive type, which generates an electromagnetic field to sense metal objects passing close to its face. 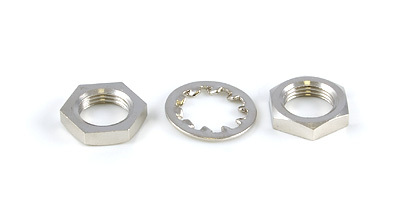 This is usually the easiest sensing technology to apply in applications where the metal object to be detected is within an inch or two of the sensor face. Note that the standard detecting distance is based on a standard shape approaching the sensor in a standard way. The real detecting distance will vary depending on the shape, thickness and type of metal being detected and will in general be between 70 to 80% of the standard distance. Connect the +12 wire from the Power Supply (that's the one with the white line) to the 3526 Brown wire. Connect the 3526 Black wire to a Digital Input on the 1018. Connect the Power supply Ground Wire and the 3526 Blue wire to the Digital Input Ground connector on the 1018. Note: When the 3526 is connected to a 1012, it will behave as a Normally Close (NC) sensor instead of Normally Open (NO). 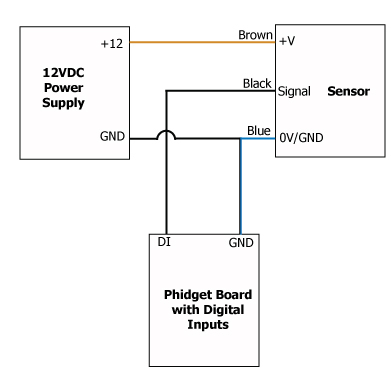 For boards that have power input, if the supplied power is within 12-24VDC, the +V line can be connected to the terminal block, powering the sensor from the Phidget. The 1019, 1070, 1060 and 1063 all accept external power.